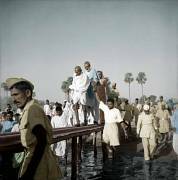 Mahatma Gandhi and associates during Gandhi's peace march in Bihar, March 29, 1947. Mahatma Gandhi at his first meeting with Lord and Lady Mountbatten, New Delhi, April 2, 1947. 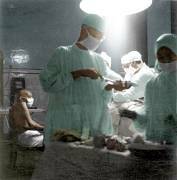 Mahatma Gandhi during appendicitis operation of his granddaughter Manu at Patna, May 15, 1947. Mahatma Gandhi talking with Premier of Burma, New Delhi, December 4, 1947. Mahatma Gandhi with Manu and Abha Gandhi in the garden of Birla House, Delhi, December 4, 1947. Mahatma Gandhi in the garden of Birla House, New Delhi, January 13, 1947. Mahatma Gandhi at Birla House, during his fast for communal peace in India, Delhi, January 17, 1947. Mahatma Gandhi writing his first message after ending his last fast, New Delhi, January 18, 1947. Mahatma Gandhi during his last prayer meeting in the garden of Birla House, Delhi, January 29, 1948. 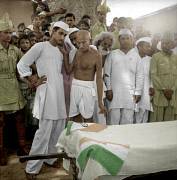 Mahatma Gandhi's dead body decorated at Birla House, New Delhi, January 31, 1948.